Ground level, walk-in isotainers. These are the metal cargo storage and shipping containers you've no doubt seen used on flatbed trucks, trains, cargo ships, even planes. Their size, weather-resistance, and strength make them an unbeatable choice as an onsite storage solution. Essentially a drop-in-place building, these steel storage containers are instantly ready to go for retailers, contractors, or anyone who needs instant, secure storage space. We've heard these called by many other names, so you're at the right place if you found us by a web-search for any of the following: Storage Pods, Storage Cubes, Metal Storage Containers, Steel Shipping Containers, Portable Storage Containers, Cargo Containers, ISO containers, ITUs, Intermodal Transport Units, land-sea storage container, or isotainers. Let us know if we missed one! Available for rent or lease, portable cargo and shipping containers from Xtra Storage are the economical and smart choice for any company in need of secure onsite storage. 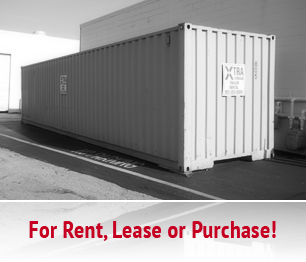 Call 937-253-0004 NOW (24/7) for an IMMEDIATE quote to rent or lease portable storage and shipping containers!